Great work does not always require a fancy camera. 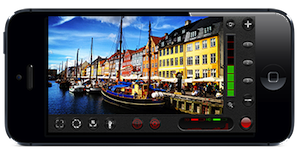 While I love shooting with my Panasonic HPX170 DVCPro HD camcorder, sometimes the iPhone is a better choice when I need to maintain a low profile and I can shoot what I need with the iPhone’s fixed lens or with a wide-angle lens attachment. There are lots of great examples on Vimeo and YouTube of videos shot, in part, with the iPhone, as well as examples of works shot entirely on an iPhone. Here are seven examples of videos shot entirely with an iPhone. 156 Turns (3:24, Seth Schaeffer and Greg Tracy, 2010, YouTube). This is one of the better examples I’ve seen of a documentary shot entirely using an iPhone. In the summer of 2010 Seth Schaeffer and Greg Tracy shot this short documentary with the iPhone 4s. The video was neither color graded nor treated with image enhancements, however, they took advantage of the Owle Bubos (since then it has been updated and renamed to Phocus) to stabilize the camera and use a variety of lenses. It is an impressive feat to shoot an entire piece like this with a iPhone and the right accessories, the secret sauce in many iPhone videos. Coffee Branch iPhone Documentary (3:00, Stephen de Villiers, 2012, Vimeo). This is a nice portrait of a person and a place shot entirely on an iPhone. The filmmaker spent a day with the folks from his favorite coffee shop. Syria: Songs of Defiance (24:52, Al Jazeera). In this video from the Al Jazeera People and Power series an undercover correspondent takes us inside the lives of Syria’s anti-government demonstrators, the iPhone allowed the filmmaker to be less obtrusive than they might have been with a camcorder. iSolation (5:07, 2012, Daniel Hume, Vimeo). An exploration of isolation amongst people living in an urban center. Shot with the iPhone 4S, edited in Premiere Pro, color grading done using Magic Bullet Looks. Framed – an iphone 4S short story (3:20, Mael Sevestre, 2012, Vimeo). While this is not a documentary, it’s a lovely example showing that with the combination of good story, interesting characters, proper exposure, expressive framing, and the judicious use of Magic Bullet Looks you can certainly make up for many of the limitations the iPhone imposes on visual storytelling. Kevin Sweet: Intervals (1:19, David Tamés, 2012, Vimeo). A short piece edited quickly, shot with an iPhone 4S and the standard video app, however, the audio was recorded using a professional lavaliere microphone and a separate recorder.Double-system sound (the term used to describe shooting picture and recording sound using separate devices and then synching picture and sound in postproduction) has experienced a renaissance in the digital era with D-SLRs and iPhones in the mix. If there are other exemplary videos shot with an iPhone that you like, I’d love to hear about them. Photo credit: Screen shot of FiLMiC Pro video application by Cinegenix, LLC. I really like this. So often it seems that the best films can only be made with the newest and most expensive camera, but these films show that with some for thought and creativity, even the camera on you phone can capture amazing things. I concur, I see different cameras like D-SLRs, mobile phones, consumer camcorders, professional camcorders, digital cinema cameras, as different types of brushes with which to paint cinematically, and it’s the artist wielding the brush, that’s more important, than the brush it self. Yes, the brush limits or empowers your “strokes,” but so much of a “stroke” is about intent and expressive context. While I don’t think it makes sense to shoot a film like Hugo with an iPhone, a lot of what’s shot with prosumer camcorders might benefit from the intimacy and portability of small cameras. Ideally we’ll work with multiple cameras, the old adage of shoot it all in the same format is no longer a viable option, mixing media and formats is yet another part of the the new video medium. Perhaps the link is broken? David — any solutions to the sound problem with iPhone filming. Would love to use something small like the iPhone but sound is often a big part of my filming. Bijoyini, As far as doing audio with the iPhone, double system is still the best way to go, though syncing remains tricky due to the iPhone’s tendency to allow the frame rate to drift. But you can run sound right into the iPhone now that FiLMiC Pro supports audio monitoring (you have to make sure Audio Monitoring is turned on in both FiLMiC Pro and iOS preferences) you can run microphones with 3.5mm mini jack outputs (e.g. Sennheiser MKE400 shotgun and Audio-Technica ATR3350 lavalier) into the iPhone mic input using an adapter cable like the Microphone Input Jack Adapter sold by KV Connection as I describe in my post, FiLMiC Pro transforms iPhone into sweet and respectable video camera here on the blog. Most of the time I’m using the iPhone for non-sync B-Roll, but if I did had to do sync with it, I’d run the audio straight into the camera if I could since the iPhone’s variable frame rate often causes problems when trying to sync up double system audio. BTW, I fixed the links. They all now go to their respective Vimeo and YouTube pages!